5. minimal storage space requirements. In order to fulfill the above requirements we have developed a color-coded blood collection and storage system. Blood is drawn into color-coded vacuum tubes (CA Greiner & Söhne Labortechnik, Kremsmünster, Austria): red = serum for 10 ml blood, green = heparin for 4 ml blood, lilac = EDTA for 10 ml blood, blue = citrate for 4 ml blood, which are prepacked per patient and per collection time together with vein puncture or indwelling catheter connectors. Color-coded blood collection tubes (prepacked per collection time) match the color of the storage tubes in the tube rack. Typically one rack is for one patient and one row for one collection time point, where tubes can be chained with rubber push-on caps. Upon arrival in the analytical laboratory, the color-coded storage tubes from patients' boxes are redistributed to new storage racks (according to color/anticoagulant) for one specific analysis (eg Sample Box A). Vacuum tubes are centrifuged using standard procedures except for endotoxin measurements . Plasma/serum is then transferred into matching color-coded microtubes (1.2 ml polypropylene tubes; MicroRack Tube System, CA Greiner & Söhne Labortechnik) (Fig 1). Since over-filled tubes increase the risk of contamination, no more than 1 ml serum/plasma should be added. The transparent polycarbonate rack accepts any number of tubes up to 96 in an 8 × 12 layout, matching the microplate format. This makes it fully compatible for the transfer of material from one to the other. The system is completed by the addition of silicon rubber push-on caps, which are provided in a 'chain' of 8 caps, making positioning and multiple tube sealing fool-proof. Usually one collection time is 'chained' and one 96-box per patient is prepared. 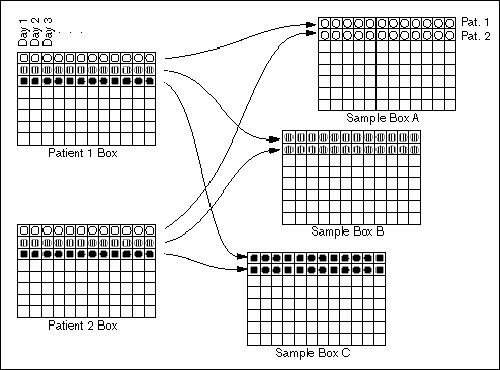 Once loaded with tubes, the position and identification of each sample can be recorded on a data card which fits into the rack lid for permanent reference. Once the lid is snapped closed, it holds each capped tube securely in position and prevents the accidental loosening or loss of caps. The MicroRack Tube System has the ability to withstand temperatures below -70°C and the lid system ensures safe transport and storage without leakage or contamination of the sample. These racks are able to be autoclaved for the re-creation of sterile conditions, if required. Sterility of new product is achieved by gamma irradiation with Cobalt 60. Upon arrival of the filled MicroRacks in the analytical laboratory, the color coded tubes are redistributed to other empty MicroRacks according to the color (= stabilizer/anticoagulant) which the type of analysis requires. 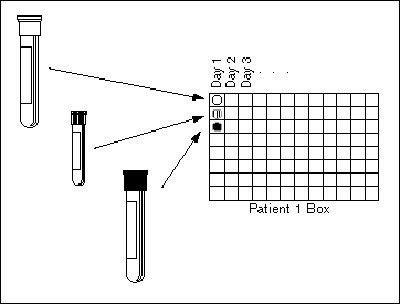 For example, one box will be filled with plasma for elastase examination (EDTA plasma) only (Fig 2). This storage procedure saves time searching for the appropriate samples when they are analysed and prevents accidental thawing of individual samples during the plasma sample selection process. This specimen collection system was used in a recent multicenter trauma study [2,3], in which multiple mediators were analyzed. Among the 56 patients with a total of 114 specimens per patient no specimen mixup (eg blockade of analysis reaction due to inappropriate anticoagulants such as creatinine with EDTA or citrate plasma) was found. The staff both in the participating hospitals during blood collection and plasma storage as well as in the analytical laboratories were highly satisfied with the ease of specimen handling upon analysis. The only problems reported were overfilled tubes, which led to problems in closing them with the cap chains. Furthermore, the system is currently being used in ongoing clinical trauma studies and in all our animal work , due to easy handling and minimal storage requirements in the freezers. We conclude that the described system fulfills all the requirements for optimal blood specimen collection in multicenter trials. In addition it has proved to be valuable in other clinical as well as laboratory animal work. We are indebted to G Leichtfried for preparing the figures and F Konrad (CA Greiner, Kremsmünster) for his ongoing support.